This yummy breakfast concoction is long gone but just looking at the pictures makes my mouth salivate at how delicious it was! 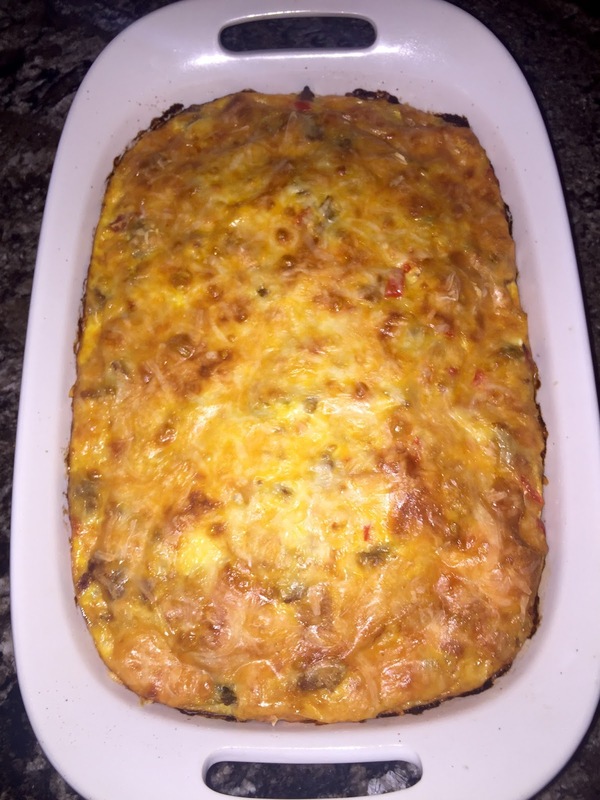 This casserole loaded with turkey sausage, veggies, lots of gooey cheese, bread and it is perfect for company – it makes a lot of food, is satisfying and of course very delicious. Here's the story behind it. My brother-in-law found this recipe and made it for us when we stayed at the house over the holidays. It was perfect and so flavorful so it was a must try for me. On a Sunday morning when it was even just my husband and I around, I made this and served it with some yummy fruit. So good, but there was of course, a lot left over. I took some to work for the girls to try and the boys reheated it for their morning's fuel up and I must say, it was even better heated up! I do love is that it's turkey sausage, eggs and veggies and the yummy salsa adds such a great flavor. I also used a lower fat Mexican cheese. An all around winner!! Great Brunch recipe too!! Add the onion, bell pepper, and garlic, and cook, stirring occasionally, until the onions are translucent, about five minutes. While the veggies are cooking, whisk the eggs. Add to the eggs, the milk, salt, salsa, 1 1/2 cup cheese, and bread. Mix to combine. Add the veggie and meat mixture, and stir together. Pour the whole mixture into the prepared pan and top with 1 cup cheese. Bake for 50-55 minutes or until the eggs are set. Let the casserole sit for 10 minutes before cutting into it. 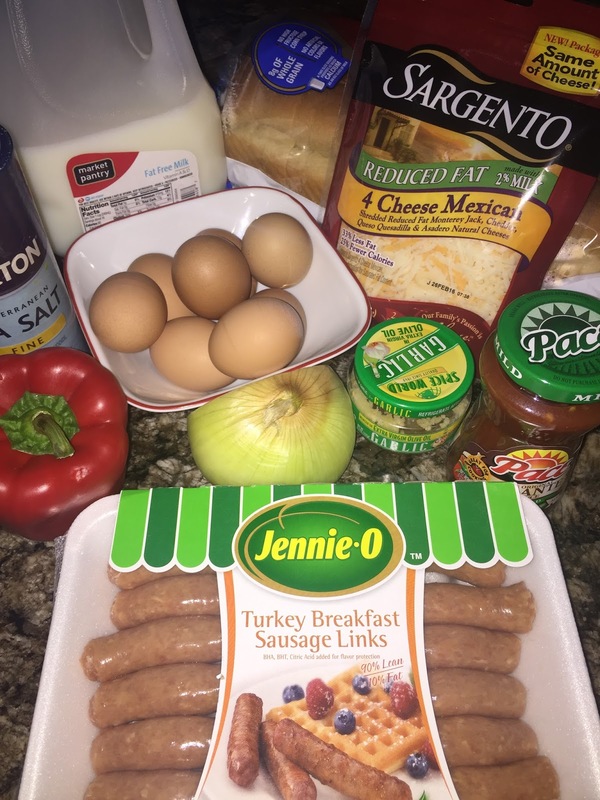 *Note, I could not find the bulk turkey sausage at our grocery so I got the little links and just removed the casings before frying it up, it worked great! That looks so good! I'm heading home this weekend and my dad always makes big weekend breakfasts when everyone is around. I am going to send this his way so he can add it to his recipe rotation!! This looks so yummy! This is perfect for a weekend brunch! This would be so great if you're having a small group over for brunch! This looks so delicious... I'm thinking I need to plan a brunch soon so I can make it! YUM! I SOOO need this on the morning of a NATIONAL CHAMPIONSHIP!! Talk about a breakfast of champions!! I make a similar Southwestern Quiche! Love ya, Girl! And thank you so much for your support last night! 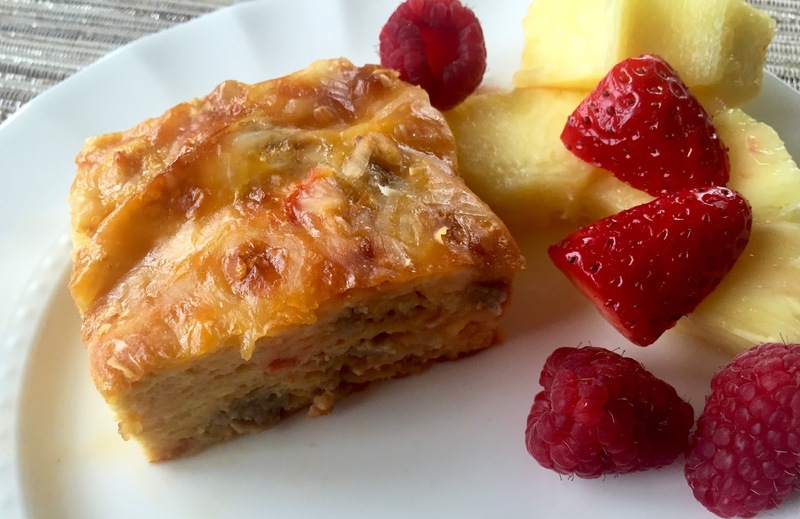 I do love a good breakfast casserole and this one looks delicious!!! love the idea of using turkey sausage in this! what a fab recipe, so thanks girl! You had me at gooey cheese!!!! This looks so yummy! 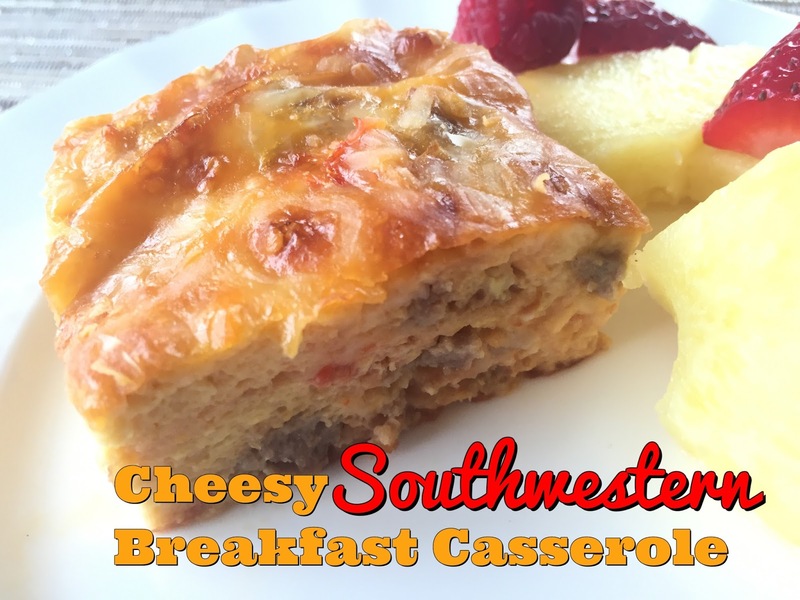 I love making breakfast casseroles, they are just the perfect comfort food for breakfast! Love the southwestern ingredients too! I LOVE recipes like this for lazy weekend mornings! Breakfast casseroles are seriously the best and easiest thing to whip together. I also like that they feed a good amount of people and only used one dish for a complete meal. Perfection! Looks delicious! Breakfast casseroles are so easy to put together, yet they taste so good. Thanks for the recipe! I love breakfast casseroles. 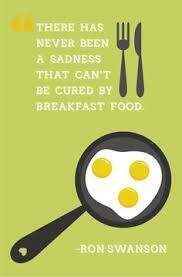 And they usually are even better reheated! Yum! I bet it's filling too with the sausage. Sounds delicious! This would be right up my hubby's alley. And, easy to make gluten free just subbing our gf brand of bread. My tummy just growled, hah. I love Jenny-o! Pork gives me wicked migraines so I only eat turkey bacon & sausage. I want a piece of this tomorrow morning! I'm going to pin it and make this this weekend. Cheese AND Southwestern? Yes, please! This looks so good! Definitely need to try this some Sunday morning. That looks like a delicious way to start the day! Congratulations on the Queen Bee feature! I need a new brunch casserole - I've been making the same one for years. Will definitely give this a try! Heading over to read about you now :)! Oh this looks so good !!!! My husband would love the southwest kick. Thanks for sharing. I see brunch or a decadent breakfast in my future! That looks delicious! 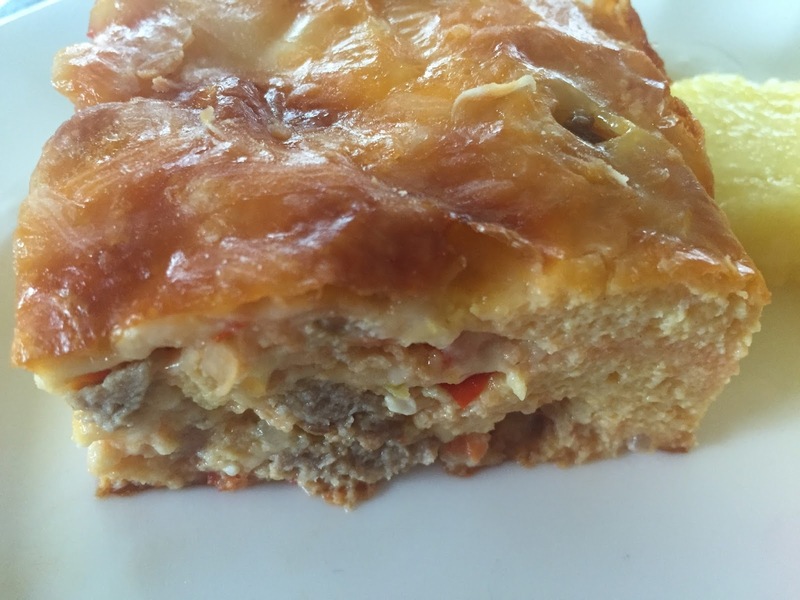 My mom used to always make a breakfast casserole for holidays when we were growing up. They were always so good. We usually had salsa on the side, but I love the idea of stirring it in! ThesThese sound great!! I'd love it if you shared at the "What's for Dinner" linky ! http://www.lazygastronome.com/whats-for-dinner-sunday-linky-26/e sound great!! I'd love it if you shared at the "What's for Dinner" linky ! Some of my favorite flavors here! This looks like brunch perfection :) Can't wait to give it a try! We love breakfast casserole and I'm looking forward to trying your recipe! Pinning and tweeting to share. 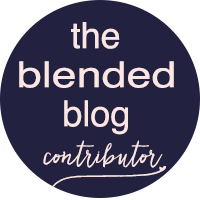 Thank you so much for linking up with us at Snickerdoodle Sunday! This looks really tasty! Would love to have you share on my linky party – What’s for Dinner! I love breakfast casserole! This one looks wonderful! Yum! I would love to have a stash of this in my freezer! Can you make this ahead and refrigerate overnight before baking like a lot of breakfast casseroles? SLOW COOKER BEEF STEW-Winter Winner! !